It looks like Stamans kit to me, just moving it along maybe, or a partner with him? or maybe he sells them to Staman in the 1st place? PS: I would buy a set of these if I had the cash, it's too simple to eliminate the biggest issue I have: risking going in the marsh and becoming immobilized where no one can recover her . Does anybody recognize Ruud Moors and are they legitimate ? I have emailed Moore for full details, photos, parts required, etc. Will post when received. I think the rubber track replacement is always on the table for weasel owners, but I'm not giving up on getting just the band replacements. Can't get any conveyor belt guys to talk to me. Surplus company in town has used belting and I am planning a trip to them to see what is available. They represent that they have some rubber conveyor track with steel cable rubber enclosed belting vulcanized to the underside of them. I'm picturing using the cable and cutting just a wide enough strip of the belting to fit into the gap between the inner and outer bands and remove four rivets per grouser and replace with bolts. Possible adding rubber track pads to the outside with the same bolt holes. The rubber belting would act as clips to hold the steel cables to the grousers. Well, I'm still headed down the conveyor belting, not bands, route for now. Price on bands from Europe are $5,500 US plus $1,200 shipping and that's a little pricey to keep the original look. So I'm fleshing out my belt idea. I went and visited the salvage yard where the belting was stored and laid my hands on it. It's 1/2" thick and 32" wide. I would use two 3" strips approx. 22 feet long per track, so 100ft at the most and I'd have enough left to do two more sets of tracks or a lot of road pads. Only problem keeping me from working on it this weekend is he will not cut it and only has a 235 length for over $1,000k. For an experiment and the issue of what to do with the left over belting has pushed me back to early next month when I can source shorter lengths already cut to the 3" width, but I have to pick them up out west and my next trip is early March. But, here is a photo of what I am thinking. Again, remove 4 rivets per grouser and lay in the 3" wide belting the entire length of one track. Drill the belting to accept a button head socket cap screw with the head on the outside of the track. The nut on the inside of the track. The cardboard laying in the grouser in the photo is what I am thinking, but, of corse it will be 22ft in length connecting each grouser to another. I'm hoping the belting is flexible enough to not affect sprocket timing. The sample I felt was very stiff, but 32" wide, so not easy to tell. I'll know more when I feel the 3" strips. I will have to join two ends together and I will do that in the middle of a grouser and offset my two splices per track opposite each other for as much strength as I can get. The intent is not to remove any existing cable and rubber original bands, but to add to the strength of them with the addition of this belting. The thickness of the belting is too thin for road pads unless I double up and then it becomes a adhesion issue. So I wil look for the thicker bands at the salvage yard and see if I can cut short pieces and acquire the correct adhesive to glue the rubber bands to the steel grouser and use like the original road pads. Where they sit on the outside of the grouser is right behind an inner band, so bolting them on at their correct location is not an option unless I drill right through an inner band and then have a nut to deal with on the wheels. Have not had any carbon based life forms from a conveyor belt company return a phone call or email on this project, so getting bands made in the US is not looking good. I may need to bandaid my tracks like everyone else to get through while trying to invent the wheel. Your last post you said you had sent an email to Ruud Moors and you were waiting a response? Their response to me was a mix of english and german and didn't make sense. Why keep the outer band? Why not run the belt from the outside rivet to the outside inner band rivet, (3 rivets) that way it has a wider, longer lasting structure, and you still keep the inner belt where the wheels and sprocket offset are running. If you stagger them, I would recommend staggering the ends of the belt over two shoes as well, but offsetting both ends of each belt there would be less tendency to fail at the single attachment point (i.e one shoe arched over a log or stump/rock). I just saw an advertisement in Farm Show magazine about adding tread sections atop your old tractor tires by applying a glue and slapping on short pads they sell, saving you the cost of a new set of tires. They use,(Cyanoacrylate combined with a rubber compound) but it may also bond some outer pads on the shoes, heck they may even cut them to length for you. I've been following this thread for a while since I'm also in the middle of a track rebuild project for my '45 Weasel, M29C 10617. For several years I have been repairing breaks in the outer bands using pieces of steel belted tire tread cut into strips and bolted across the break in the outer band. The procedure I came up with consists of cutting and removing the existing band pieces back to the middle of adjacent grousers (in some cases across multiple grousers, depending on the extent of the failure), then inserting and bolting down the repair piece under the steel brackets from the original band. I found that I needed to remove only the outside rivets and bend the bracket up to insert the repair piece, then clamp them back down and bolt them on with 5/16 bolts and lock nuts in the original rivet holes. I stabilized the section of steel belted tire tread by drilling down through everything (bracket, repair piece and grouser) and installing a 1/4" bolt and nut at each end of the repair. This method worked great until I had a complete track failure, when all 4 bands broke across the whole track, between two grousers. I tried my usual repair method but it kept pulling out and would not hold the track together. Later I discovered the tire tread material I used was not the steel belted variety, so it wasn't strong enough to hold without pulling apart. In the mean time, I researched and designed a conveyor belt-based system similar to the method used by Snake River 4X4 and others. Like a lot of other Weasel owners, I would much rather replace the bands with the original style reproductions, but I can't see paying more for the repro bands than I originally paid for the Weasel. I'm an engineer, so bear with me if this gets a little technical. I purchased conveyor belt material from a company called California Industrial Rubber <http://www.californiaindustrialrubber.n ... ts-belting> here in California. I was able to obtain custom cut belt lengths from their Yuba City branch. Their corporate headquarters is located in Fresno, but the Yuba City branch does most of the custom cutting for the other branches (Sparks, Bakersfield, Merced and Tulare). Contact them if you need conveyor belt material (pretty sure they ship anywhere). They were great to work with and had my order ready in only two or three days. Cost for 4 conveyor belt strips per track (two @ 22' x 3/4" x 2.75" and two @ 22' x 1/2" x 3.25") was less than $600/track, without shipping because I picked them up in Yuba City on my way to a Military Vehicle meet. Right now I'm about 30% complete on rivet removal on one track (only doing one track at a time). Best method so far is using a cutoff wheel with a 1/4" wide disc to grind off the rivet heads, then punch them out with a drift. I cut the track into 11 pieces of 5-grouser sections to make it easier to handle the rivet removal. Next step is setting up a template for drilling the belting material, then bolting together a track. I will stagger the spices across different grousers to distribute the load and reduce the risk of the bands separating across the splice. I will also reinforce the outer band splices by bolting on an extra piece of banding across 4 pairs of adjacent bolts (on top of the spice). Feel free to PM me or reply to this post if you have questions of want photos. Can't wait to get the Weasel mobile again! Welcome to the track discussion. It sounds like the conveyor belting idea we both came up with holds promise. You are removing all original bands and replacing with belting bolted through existing rivet holes. I may end up there. But for now, I'm hoping that adding belting material to the grousers and leaving the original bands will help hold them all together. Someone posted that the height of whatever replaces the center bands has to match the original height exactly or it would throw off the sprocket timing, so make sure you engineer that into your equations. I was tempted to drill an extra hole in each grouser to attach my belting to to prevent the bolts at the far edge of each strip from ripping away, but my son says if I alter the original grousers in any way, he will hijack the restoration, so I am reluctant to do that, but we will see. I own the frill. Weasler, thanks for the suggestions. But, I'm easily confused and I'm not sure what you are advocating. You caution us about installing new rubber on old steel, which is a valid point, and then you suggest we just put on conveyor belts and be done. Put conveyor belts on what? Are you suggesting NOS grousers and new rubber belting and road pads and have, basically and whole new set of original style tracks? I have seen the NOS grousers for $50 each, so that would be $5,500 plus shipping. Belts with clips from Europe are $6,700 delivers, so $12k in materials plus labor plus road pads, I don't know if the NOW grousers come with road pads, if they do, they are 75 year old rubber. If this was a museum restoration or a vehicle taken to judging standards, that might be n option. But I believe that most of the readers of this thread are looking for something a little more economical. Even at the cost of originality. But I also believe that most of us are looking for a compromise or blending of both. Just putting on CAT rubber tracks and new sprocket wheels is always an option, but may or may not accomplish keeping the "spirit" of the weasel alive. Keeping the steel grousers on the weasel, even as a band aid or even if it is going to be a preventative maintainance issue, might be the best we can hop to accomplish. I don't know about you guys, but the grousers on my Weasel are in great condition with very little rust, no cracks and no signs of breakage. My Weasel was used mostly in the snow before I got it, as emergency transportation in the Sierras for at least 30 years of it's prior life. It was painted orange and had tail lights and backup lights installed on it (from a civilian car or truck), and has the Korean War era dual headlights and removable aluminum hard top. The grousers have what looks like zinc chromate primer on the inside surface (band side) and the mostly intact remains of a black rubber coating on the outside (road side). The road pads are about 90% intact, unlike most tracks I've seen. So I don't have any worries about re-using my grousers - it's the bands that need help. I also have a spare set of tracks that came with the Weasel when I bought it, along with a complete set of '44 marked bogies still mounted to their arms, and a spare engine I sold to a fellow Weasel owner in need. 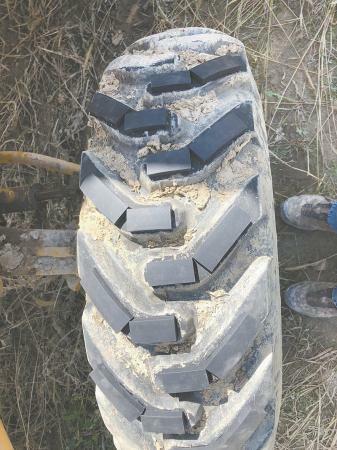 The spare tracks are an older, 20" set with broken bands. They have a slightly different style of outer bands, sort of a sheet metal cap over the band on each grouser instead of the metal clips molded into the band. The metal grousers on this set of tracks are also in good condition, with very little rust, even though they are stored outside. Maybe it's just California, but I'm not in the SoCal desert by any means (I'm in the Northern California Foothills between Sacramento and Lake Tahoe). I plan to use this extra set of tracks for parts as needed, and have already salvaged a couple of center guide pieces to replace missing parts on the good set of tracks (missing when I got it). I agree that I want to keep the "spirit" of my Weasel alive and keep it as original as possible, with the exception of throwing money at it to make it better than new. The backup lights and big round tail lights had to go, but then so did the exhaust pipe sticking through the rear panel (replaced with an NOS muffler and original guard). A set of conveyor belt bands bolted to original grousers will be barely noticeable, especially when people watch it fly through terrain impassible to a wheeled vehicle. Most people won't even realize the tracks have been repaired, just that they work exceptionally well. I like to toss my two cents in here too. I had a Weasel back in 1994. When I rehabbed the tracks I burned the rivets out with an Arc Welder using solid carbon rods with the welder set at its' maximum output. One quick touch to the head of the rivet and BRRRRZZZHHHTTT, gone. Nothing else touched or damaged. The track I had was Type 3, wide band at outer circumference. I used 4 ply nylon fabric conveyor belt cut into four inch strips. The twelve rivets that are outside the bands that the bogie wheels ride on were the ones to get the heat. I then took a pattern of four of the rivet holes and a measurement for a steel plate. I took this info to a metal shop and had enough plates cut and holes punched in them to sandwich the conveyor belt between them and the grouser. Grade eight bolts and poly lock nuts were the fasteners with the heads of the bolts to the outside of the tracks. The first track took around fifty two hours of work, the second only around thirty five. I still have the tube drill bit for drilling the holes in the belt. To sum up, I rolled the h*ll out those tracks for the better part of three years. Drive sprockets, bogie wheels, return rollers, idler wheels and tracks all behaved as normally as I would think they should. I wound up selling my Weasel to Mike Howard at Liberty Auto Restoration and used the money to by my Command Car. I wish I still had that Weasel, it was a great and fun little machine. Thanks DRH, I was looking for a faster way to remove the rivets. I have an arc welder, so I just need to pick up some carbon rods. Great idea! I have extensive experience with Weasel parts concerning the drive gear and track that worked perfectly after implementation. No need to worry about worn teeth on the drive sprockets, they can be repaired. If the vulcanized rubber on the return rollers, front idlers and rear drive wheels has worn away, that can be repaired too in your garage. They conveyor belt rubber I used was only 1/2" thick too. The top plates were 3/16" thick "U" channel, cold rolled steel with 1/2" legs on the "U". The "U" is run parallel with the grouser so the edge of the plate doesn't bite into the Con. Belt. I’ve been following this thread with great interest. A while back the M114 track conversion was mentioned. I did the track conversion on my weasel. It’s not easy and it takes a lot of machine time and fabrication skills to make it work. M114 track used to be available from Barstow truck parts. After the father died the son sent everything military to the scrap yards. Track was cheap and plentiful along with sprockets and guides. I had no desire to drill out thousands of rivets. I can say that the local conveyor belt company was able to slit belting for me to make part of the conversion work. They also told me that they can punch put belting to any drawing for a very fair price. All of that being said I did this conversion about 18 years ago. M114 track is virtually indestructible and has rubber to ride on the road. It is heavier, and you do lose top speed and it is not quite as wide as M29 track. I will attempt to attach photos later tonight.